Is anyone out there using Indiemapper? Here’s an overview of it. I just downloaded the 30-day trial to play for a bit. I like its interface. 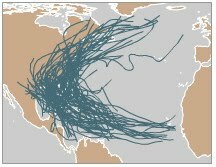 I uploaded this shapefile of hurricanes and started designing a map within 20 seconds. Good export options too. This entry was posted in GIS, web mapping. Bookmark the permalink.